Grand Rapids, MI - The second day of competition at the Intercollegiate Bowling Championships produced some surprise winners to go along with the demise of a couple of local favorites. Thursday's competition featured 32 baker games of bowling, allowing the 16 teams on both the men's and women's sides to be seeded going into Friday's double elimination bracket competition. After 10 hours of grueling best-of-seven baker matches, the field has been narrowed down to the top four men's and women's teams, who will come back Saturday morning and continue the double elimination competition. On the women's side, the University of Nebraska-Lincoln Cornhuskers, seeded first going into Friday's competition and ranked number two in the country, won two difficult matches to advance to Saturday's competition. Nebraska, who had received a two-round bye for being seeded in the top four after Thursday's competition, squeaked past Erie Community College four games to three. They then defeated the California State - Fresno Bulldogs four games to two to advance to face Arizona State University, who knocked off Shippensburg University and Wichita State University. Arizona State had an easy time of it, sweeping the four games versus Shippensburg and then defeating Wichita four games to one. In the loser's bracket, Shippensburg rebounded form the beating handed to them by ASU to knock off three of the top teams of the country. The "Ships" swept Indiana State and then knocked off Central Missouri State University. Their final match of the day was against Fresno State, led by All Americans Cathy Krasner and Jackie Edwards. Shippensburg was not intimidated, though, defeating Fresno in six games to advance to Saturday's competition. They will face Wichita State University, who came off the loss to Arizona State having to face defending champion Morehead State University. Morehead came into this tournament attempting to win their second consecutive National Title and third in the last four years. It was not to be, however, as they fell to the Shockers in five games, thus eliminating Morehead from the tournament. Wichita will face Shippensburg on Saturday, the winner of which will face the Nebraska/ASU loser for the right to face that match's winner for the National Championship. In the men's bracket, St. John's University made quick work of its two opponents, an overmatched Arizona State team and a confident Wichita State squad. Wichita led the qualifying, the only team to average over 200 in the baker competition. That proved to be meaningless, as they fell to St. John's in a quick five games. At least they won one game, as St. John's had just swept Arizona State, one of the top five teams in the country in four games, including a final game 260-162 shellacking. The Red Storm will squareoff with the 1999 Champs, Western Illinois University, as WIU defeated a scrappy Michigan State Squad and an upstart Kansas Jayhawks team. Michigan State had defeated both Penn State and Central Missouri State in seven games. The Spartans, located in Lansing, MI (only an hour from Grand Rapids), then went to a seventh game with Western Illinois, but could not pull of the hat trick of seven-game victories, as WIU, led by First-Team All American Derek Sapp, handed them their first loss of the day. Michigan State then had to face the number one ranked team in the country, Saginaw Valley State University, in a battle of Michigan teams. Saginaw had tremendous fan support, as some of the student body (including the Cardinal, their mascot) showed up to give Saginaw support. This proved to pay off early, as Saginaw defeated the Spartans in six games. Saginaw's victory advanced them to face Central Missouri State University, in perhaps the most nerve-wracking match of the day. Saginaw took a 1-0 lead, but Central won the next two, including a front-ten-strikes 289 game. Central Missouri's Mike Loehring got the first strike in the tenth frame, but couldn't close the deal on the perfect 300 game. Saginaw fought back, winning the next two games to take a 3-2 lead, but couldn't hold off CMSU. Central won the final two games for a come-from-behind victory. CMSU, however, could not keep their momentum going as they fell in the next match to Wichita State in five games. Wichita advances to Saturday's competition where they will face the Florida State Seminoles. FSU, sent to the loser's bracket early in the day at the hands of the Shockers, will seek revenge against Wichita after making a run to finish the day. Florida State defeated Erie Community College 4-2, San Jose State University 4-1, and then the University of Kansas in six games. Said Senior Seminole Bob Schoneman, a first-time participant at the IBC's, "This is my only Nationals, but wow, what a Nationals it is!" The Florida State-Wichita State winner will face the loser of the St. John's-Western Illinois match for the right to advance to the final match against the SJU-WIU victor. The winner will be crowned the 2001 IBC Champions. LONDON, ENGLAND, April 20, 2001 - "Great Scott!" might be the official U.S. cheer at this year's AMF Bowling World Cup, to be staged at PS Bowl in Pattaya, Thailand, November 4-10. National amateur champion Scott Norton and Wichita State University bowling standout Kristal Scott will represent the United States at the 37th consecutive edition of AMF's international bowling classic. Both are members of Team USA 2001. Norton, a 19-year-old from Cypress, Calif., who attends California State University-Fullerton, qualified by winning the men's national amateur championship during the Team USA trials last December in Reno, Nevada. The college freshman is no stranger to international competition, having won medals in the 2000 Lee Evans Tournament of the Americas and FIQ/WTBA World and American Zone Youth Championships as a member of Junior Olympic Team USA 1999. In addition to being the 1999 Junior Olympic Gold national champion, Norton is the 2000 American Bowling Congress Chuck Hall Star of Tomorrow and the California Women's Bowling Association Star of Tomorrow. He is also a co-winner of the 2000 John Jowdy Columbia 300 scholarship award and the 2000 Southern California Junior Bowler of the Year. Norton's personal bests include 10 perfect games and an 805 three-game series. Norton has been bowling for 14 years. H's mother and coach, Virginia (Park) Norton, is a former professional bowler and a member of the WIBC Hall of Fame. Though she is majoring in business management at Wichita State University in Wichita, Kan., 19-year-old Kristal Scott hails from Painesville, Ohio. She was a first-team Collegiate All-American Bowling Team pick last year and deemed the Collegiate Rookie of the Year. A two-time member of Junior Olympic Team USA, Scott competed in the FIQ/WTBA American Zone Youth Championships last summer in Mexico, where she won a gold medal in the team event and bronze in girls' doubles. Scott finished second in the U.S. national amateur championship but assumed champion Kelly Kulick's place in the Bowling World Cup when Kulick announced she would turn professional. Scott has won state all-events titles in Ohio and Kansas and is the current Ohio state amateur champion. Her personal bests include a 300 game and a 772 three-game series. Like Norton, Scott is a 14-year veteran of the sport. She is coached by WSU bowling coaches Gordon Vadakin and Mark Lewis, and former Team USA coach Jeri Edwards. Scott is trying to become the first U.S. woman in 11 years to win the AMF Bowling World Cup. The last, Linda Graham, won her title in Pattaya, a short distance from the site of this year's tournament. Although U.S. bowlers have won 11 Bowling World Cup titles since the tournament's inception in 1965, they have been shut out since 1995, when Patrick Healey Jr. won in Brazil. The AMF Bowling World Cup, founded by AMF Bowling Inc., is the largest annual international sports competition in the world in terms of number of participating countries. A record 88 countries, and 155 men and women athletes, competed last year in the 2000 AMF Bowling World Cup in Lisbon, Portugal, which was won by Sweden's Tomas Leandersson and Wales' Mel Isaac. AMF, PS Bowling Group, Singha Beer of Thailand and Coca-Cola are sponsoring this year's championship. LONDON, ENGLAND, - Tournament host Sonny Lim will roll out the red carpet for the world's top amateur bowlers when the annual AMF Bowling World Cup comes to Pattaya, Thailand, November 4-10. Lim, whose hosted the 1979 and 1990 Bowling World Cup in Bangkok and Pattaya, respectively, is providing athletes and fans with a new state-of-the-art facility, called PS Bowl Pattaya, for the 37th consecutive edition of bowling's international classic. The center is located in the heart of the tropical resort city in southeast Thailand, a brief stroll away from the inviting blue waters of the Gulf of Thailand and its surrounding sandy white beaches. The ultra modern PS Bowl complex, of which Lim is managing director and owner, is of a steel-and-glass outer frame and has three floors. There is a full supermarket on the ground floor with snack bar and ATM bank machine. Many small retail outlets fill the first floor, making it easy to purchase clothes, sportswear, watches, souvenirs and other amenities. 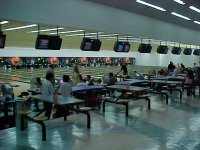 The 32-lane AMF-equipped bowling center is situated on the top floor, where a mezzanine level houses the glassed-in offices overlooking the lanes. First-class facilities within the center include a full-service pro shop, spacious foyer and bowlers' seating area, snack area and lounge. The 37th consecutive edition of the AMF Bowling World Cup, founded and sponsored by AMF Bowling Inc., is expected to attract male and female competitors from more than 80 nations. A record 88 countries, and 155 men and women athletes, competed in the 2000 AMF Bowling World Cup in Lisbon, Portugal, last October. Sweden's Tomas Leandersson and Wales' Mel Isaac are defending champions. Singha Beer, Thailand's world-renowned ale, and Coca-Cola will join AMF Bowling and PS Bowling Group as sponsors of the 2001 AMF Bowling World Cup. Thai Air, famed for its Royal Thai in-flight service, is official airline of the championship. P.S. Bowling Group, AMF Bowling's distributor in Thailand, is the tournament organizer. Grand Rapids, MI - The first 32 baker games are completed at the Intercollegiate Bowling Championships with some familiar names near the top. After Thursday's qualifying round at Spectrum Lanes, the Wichita State University Shockers (Wichita, KS)and the University of Nebraska Cornhuskers (Lincoln, NE) lead the men's and women's divisions respectively going into Friday's double elimination competition. On a very challenging lane condition, both Wichita and Nebraska took early leads in the qualifying competition and held on throughout the day. WSU, in the 32 baker games, has knocked down 6542 pins (204+ average) to lead the men's division by 78 pins over second place Western Illinois University (Macomb, IL), the 1999 IBC Champions. In third place is the University of Nebraska (Lincoln, NE), having knocked down 6349 pins, followed by St. John's University (Bellerose, NY), who felled 6306 pins for 32 baker games. The number one ranked team in the country, Saginaw Valley State University (Saginaw, MI) currently stands in 11th place at 5909 pins. On the women's side, the Nebraska Cornhuskers, led by Team USA members Diandra Hyman and Shannon Pluhowsky, outscored the Arizona State University Sun Devils (Tempe, AZ) by a whopping 209 pins to claim the number one spot after one day of bowling with 6103 pins. Wichita State University stands in third place at 5867 and the Fresno State Bulldogs (Fresno, CA) are in fourth, two pins behind the Shockers of Wichita. Defending Champion Morehead State University (Morehead, KY) is in fifth place at 5846. Morehead is looking for its third IBC title in the last four years. On Friday, all 16 men's and all 16 women's teams return for double elimination competition. Teams will be seeded based on Thursday's 32 baker games, with teams seeded 1-4 receiving a two-round bye and teams seeded 5-8 receiving a one-round bye. Competition will by all baker games, best four out of seven games wins. This format will continue all day Friday and into Saturday until a champion on each side is crowned. In other news, Bill O'Neill of Saginaw Valley State University and Shannon Pluhowsky of the University of Nebraska-Lincoln won the Bowling Writers Association of America's Collegiate Bowler of the Year awards for the men and women, respectively. Pluhowsky also won the National Collegiate Bowling Coaches Association Most Valuable Player award, while the men's honor went to the current U.S. Amateur Champion, Scott Norton of California State University-Fullerton. The First Team NCBCA All-Americans were Norton, O'Neill, Andrew Cain of Arizona State University, Andy Lomanto of St. John's, and former Team USA member Derek Sapp of Western Illinois University. The women's First Team All-Americans were Pluhowsky, Hyman, Robin Crawford of Morehead State University, and Cathy Krasner and Team USA member Jackie Edwards of Fresno State University. For more information on this story, please visit College Bowling USA's web site on bowl.com. Remember to check back at Bowlingfans.com tomorrow night for more updated scores and information from the double elimination bracket.